IP (Internet Protocol) Address is like your online identity. Every device has own and unchangeable IP Address but in Android device but we can temporarily change IP address by simply using free VPN (Virtual Proxy Network) Application. Here, We’re going to show you how to Hide IP Address by using free VPN for Android. Here are the 3 main Questions, and the answers will definitely help you in clearing all doubts. World Top 5 Games: The Best Games of all time. The Internet service provider (ISP) assign an IP Address to your device when it’s connected to the internet. Whatever you’re doing on the internet, your activity can be tracked anytime. If Someone does something illegal by using the internet so cyber crime department officers can find the location of anyone by just using an IP Address. The IP address is just like your online identity card. VPN ( Virtual Private Network) is service can be used to mask an IP address. For Example, My Original IP Address Geolocation is showing in India Country but by using free VPN service for Android, I can hide my original IP Address and I can use a fake IP Address Geolocation by using another country like United States. VPN service hides the original IP Address and covers with the different IP Address temporarily. 1) Surf Anonymously: Install Free Vpn Application and surf anonymously by hiding your online identity. 2) Visit Any Website on Web: Visit any website, comment on any website, your activity will not be tracked. You Can visit any website which is not available for your country, you can also visit any blocked website by using VPN Service. 3) Enjoy Those Apps and Games which is not Available for your Country: Pokemon Go game was the first release in the U.S then after some days in India but at that time when Pokemon go was not available for Indian users. I was playing this game in India because I was using a VPN by setting United States Country, hope you get it. 4) Feel Free to Surf The Web: Surf anything without anything restriction, if you’re using VPN service, your activity can’t be tracked. Firstly, Check your IP Address original location by searching on google, just type My IP Address on google search bar then Google will show your IP Address. After that click on any website you get a search result, you will get the all desired information on IP Checker websites and you will get all details about your IP Address including country, state, city, etc. The tunnel is a VPN provider application for Android. A good user interface, easy to use and it gives 500MB per month for using VPN Service and if you want unlimited data, go with premium. 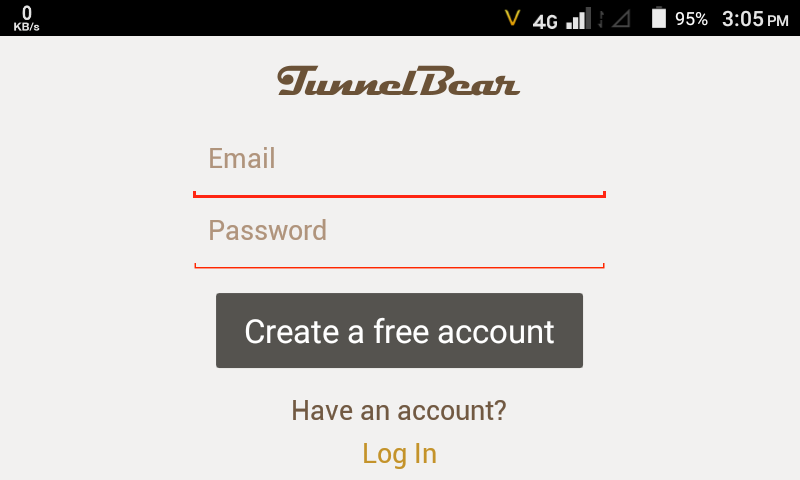 Tunnel Bear is a decent application but incases you did not find this app helpful, simply try another free VPN app. There are many applications is available on google play for providing free VPN service. Enter Email and password to create a free account. Simply create the registration process. I suggest you enter the right email because it will ask you to complete the process. There are up and down two options, enable tunnel bear and select country. It’s a simple process, Click on the switch to enable tunnel bear and then select the country like U.S, Singapore and you’re free to go anywhere on the web. After connecting VPN service, Search Again your IP Address Geolocation by typing on Google My IP Address. This is the simplest way to check VPN service is working properly or not. After changing the IP address you can access content blocked for your countries and you can browse anonymously because you’re using fake Ip address. Hey there! I’m at work surfing around your blog from my new iphone 4! Just wanted to say I love reading your blog and look forward to all your posts! Carry on the outstanding work!